Apparently Jacey has the chickenpox. I then called the SAP to see when they were exposed since it typically takes a week or two after contact to get any spots. Come to find out the child had a pretty decent case yet the parents waited a week to tell the school age program. Needless to say, thanks to their lackadaisical attitude, we had no forewarning, basically door signs one day and spots the next. The worst part though, is I have never had a full blown case nor a vaccination for it. Pray that I don’t get it, cuz when Momma ain’t happy, ain’t nobody happy….LOL! 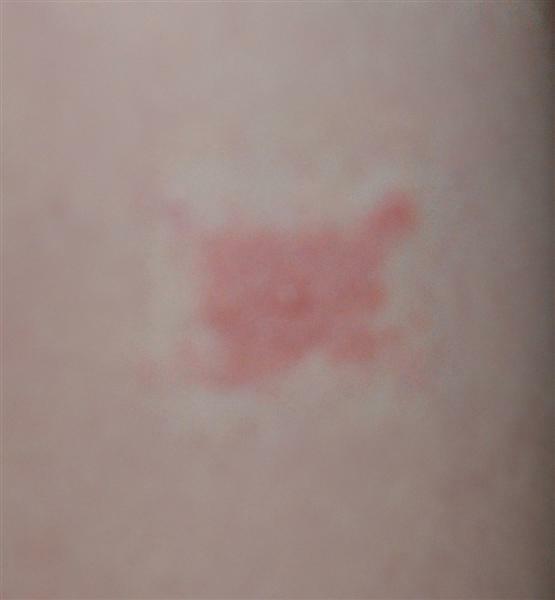 A really bad picture of one of Jacey’s pox….no, it is not a n.i.p.p.l.e! I hope she doesn’t get them that badly and that you can manage to stay away from them. I, too, have never had them before. Poor thing! How is she feeling? I had a double case of chicken pox as a child. Missed a TON of school. There were pox on top of pox. Awful! I hope you can avoid it — just watch yourself. Chicken pox can be a bit ‘trickier’ during adulthood. I hope you don’t get it!! I just remember that when I had it all the kids in my neighborhood got to come over and play so that we all got it!! And it is itchy!!! I hope she’s feeling better! And that you don’t get it! I actually wish we lived nearby so we could have a chickenpox party. We didn’t vax the younger two for it because I want them to get natural immunity, so much better!